Systems Command is the con- tractor. The Lukens Steel Co., Coats- ville, Pa., has introduced a new industrial and safety floor plate, named Sure-Foot™. The company recently published a brochure con- taining information on the new product's sizes, applications, tech- nical details, and advantages. The brochure has been orga- nized to meet the interests of purchasing managers and design- ers who are concerned with the selection of floor plate. System, Inc. (WATERCOM), Ar- lington, Va., has filed an appli- cation with the Federal Commu- nications Commission requesting authority to construct and oper- ate an automated communica- tions system serving the Missis- sippi, Illinois, and Ohio Rivers and the Gulf Intracoastal Water- way. The submission of this applica- tion follows the adoption of rules by the FCC on January 29 of 1981, allocating the 216-220 MHz band for use by automated mari- time communications systems serving the inland waterways. FCC proposes operation through- out the GIWW, Mississippi — in- cluding the Morgan City route and the Atchafalaya River, Illi- nois, and Ohio Rivers, with the exception of small regions at the northernmost portions of the Mis- sissippi and Ohio Rivers. COM System, those two segments of the rivers are not covered by this application due to the need to complete further engineering to comply with the technical re- strictions imposed on the use of the 216-220 MHz frequency band by the FCC. These segments will be covered by an application to be filed in the near future. Hundreds of ships every week sail in and out of Buenos Aires and other ports. Thousands of communication messages pass through the wires between ships, charterers and owners. Millions of dollars are transacted daily through banks doing business with Argentina. 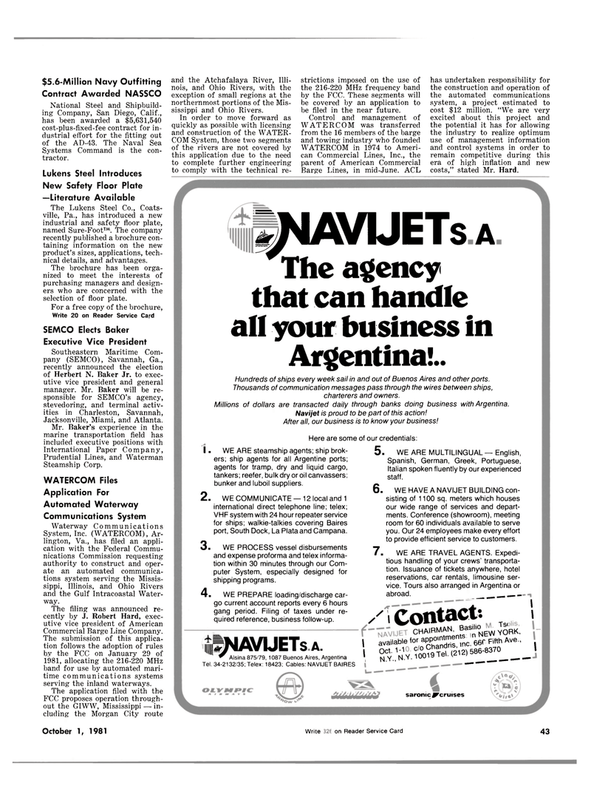 Navijet is proud to be part of this action! After all, our business is to know your business! VHF system with 24 hour repeater service for ships; walkie-talkies covering Baires port, South Dock, La Plata and Campana. 3. WE PROCESS vessel disbursements and expense proforma and telex informa- tion within 30 minutes through our Com- puter System, especially designed for shipping programs. 4. WE PREPARE loading/discharge car- go current account reports every 6 hours gang period. Filing of taxes under re- quired reference, business follow-up.